Advanced atherosclerotic lesions cause the majority of heart attacks and strokes in humans. Platelet-derived growth factor (PDGF) is an important mitogen for smooth muscle cells (SMCs) and is thought to recruit SMCs out of the vessel wall to drive neointimal fibrosis and atherosclerosis. We recently demonstrated that PDGF receptor β (PDGFRβ) signaling inhibits vascular SMC differentiation in mice ( Olson & Soriano 2011). We are building on these findings to develop a mouse model for SMC-specific activation of PDGFRβ, which will allow us to investigate SMC dedifferentiation, recruitment, and proinflammatory signaling during atherosclerosis. 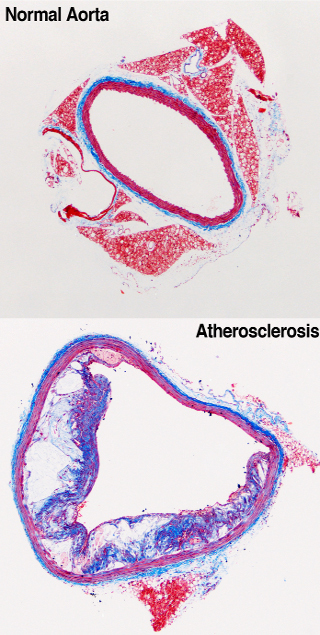 Our preliminary studies suggest that this approach leads to advanced atherosclerotic lesions throughout the arterial tree, creating a lethal atherosclerosis burden in mutant mice. We expect this new mouse model to allow us to investigate the critical question of how SMCs in the vessel wall are transformed into neointimal myofibroblasts in advanced stages of disease.